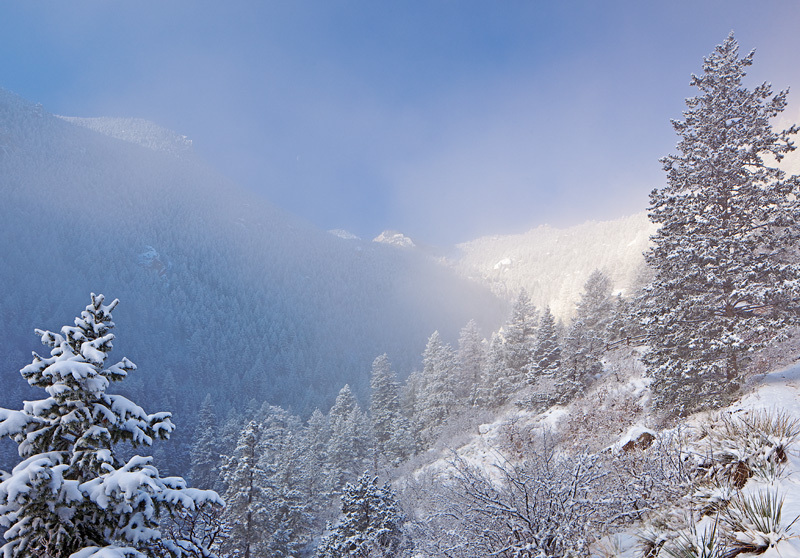 Hiking up through dense fog on the Barr Trail, after a light overnight snowfall in March. I was working a night shift, forecasting the weather for our area in southeast Colorado. A quick moving snow storm was moving through the state, and typical of the storms this winter, the storm was a bit of an underachiever. But, it occurred to me that a light overnight snowfall followed by rapidly clearing conditions aloft was a classic recipe for fog in this part of the country. In addition, the winds looked like they would stay from the southeast much of the following morning. Southeast winds are up-slope along the Rampart Range west of Colorado Springs, and tend to really reinforce foggy conditions along the lower slopes of the range. So, I went home and charged my camera batteries, then set the alarm clock for an early rise. After a bit more than four hours of sleep, I woke and made the trio north towards Colorado Springs. 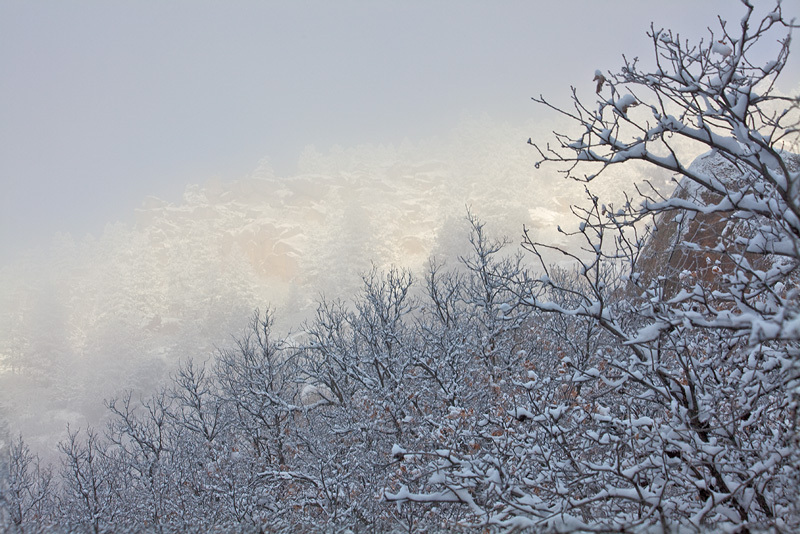 My Initial plan was to photograph Garden of the Gods in the clearing conditions that I expected. I got to the Garden of Gods exit and turned towards the park. I got close to the visitor center and encountered police lights ahead of me on the icy, snow-covered road. I hit the breaks and slid down the road, narrowly avoiding one of the patrol cars that was stopped for a previous accident. I was not anxious at this point to climb the steep road to an overlook of the park in my 2WD vehicle with worn tires, so I continued along the main road towards the inner area of the park. Sunrise was only 15-20 minutes away, and there was now enough light that it became obvious that the fog was not going to clear by sunrise–it was just too dense. 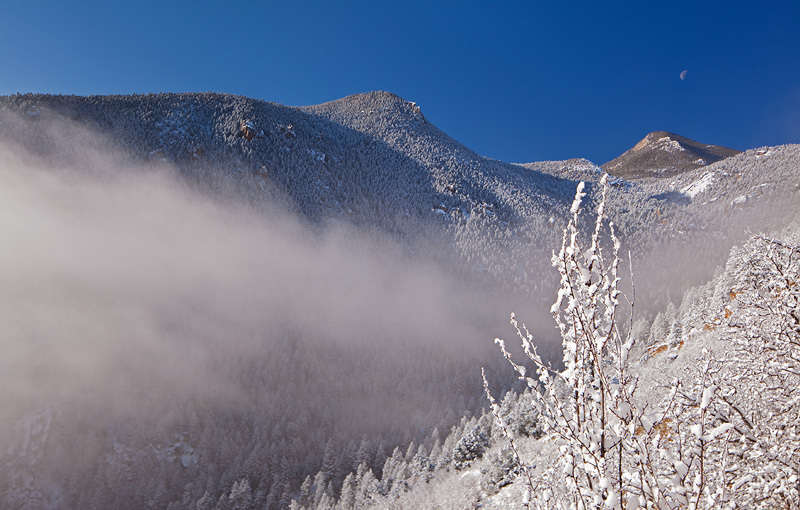 I decided to continue west towards Manitou Springs, with ‘Plan B’ in mind–head up highway 24 towards Woodland Park, with the idea of getting above the clouds to photograph the slopes of Pikes Peak. In the past, this would have been much easier–simply head up the steep narrow Rampart Range Road. Unfortunately, this road has been closed since the catastrophic Waldo Canyon Fire, so I needed to simply get high enough to clear the clouds. Highway 24 climbs from around 6500 feet to over 8000 feet as it heads north, and I knew this would do the trick. 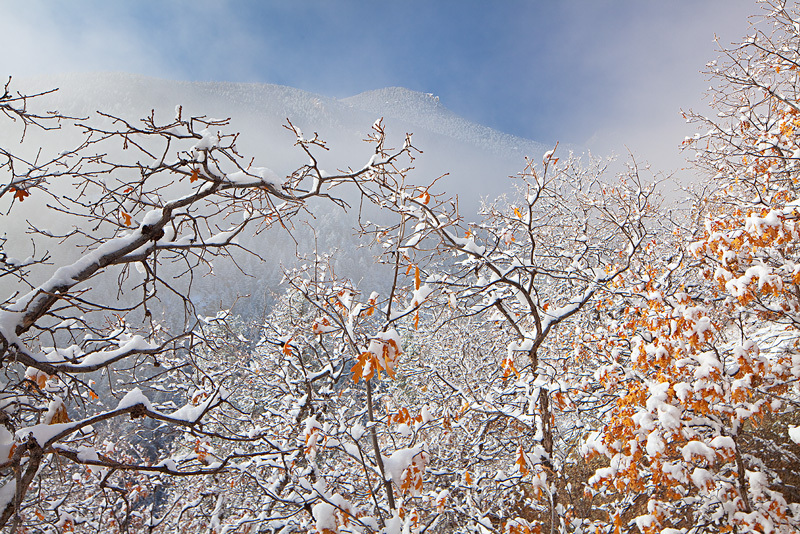 Snow covered trees and fog on the Barr Trail, March, 2014. I had to make another split-second decision, continue on and risk being stuck in traffic, or go for ‘Plan C’. I realized that it had been a while since I had been on the Barr Trail–the long trail that climbs 7000 feet up the southeast slopes of Pikes Peak. 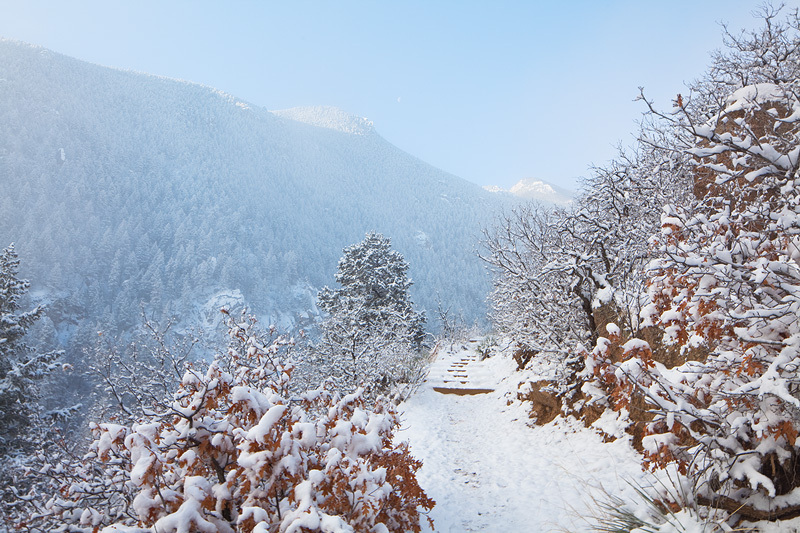 Its the trail used by runners in the annual Pikes Peak Marathon and Ascent. I quickly made the exit into town, and headed up Ruxton Avenue to get to the trail head. This road was icy too, and I didn’t want to risk the last steep section to the trail, so I parked farther down the road and hiked up the road past the Cog Railway station to begin my ascent up the trail. It was still foggy, but it didn’t take long before I started seeing some clearing conditions ahead–maybe a mile up the trail. It was a Sunday morning, and some early risers were already doing their daily training on the Barr Trail. A couple trail runners descended the trail ahead of me, and as they jogged past they exhorted me to climb a bit higher for even better views of the terrific atmosphere. View from above the fog on Pikes Peak’s Barr Trail. 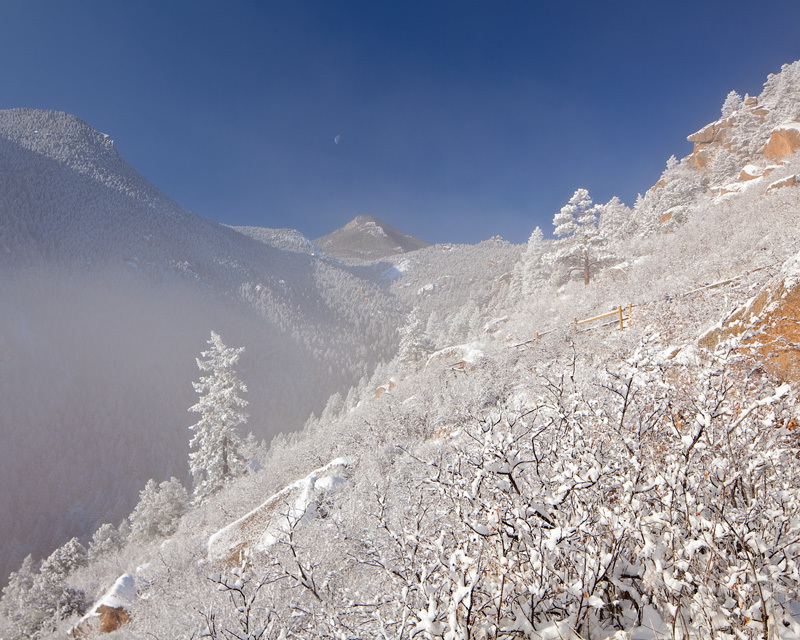 Quarter moon appears in the distance through fog clearing from the Barr Trail on Pikes Peak. 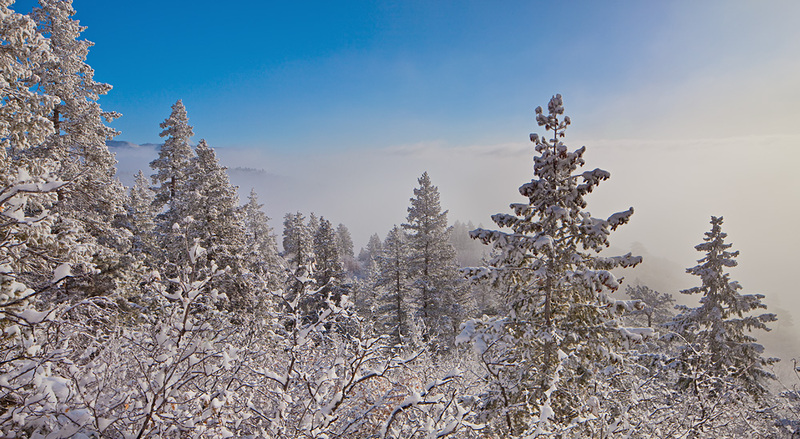 As I finally got above the clouds, about two miles up the trail, the grand scene unfolded below me as the fog layer swirled through the canyon and gradually lifted. 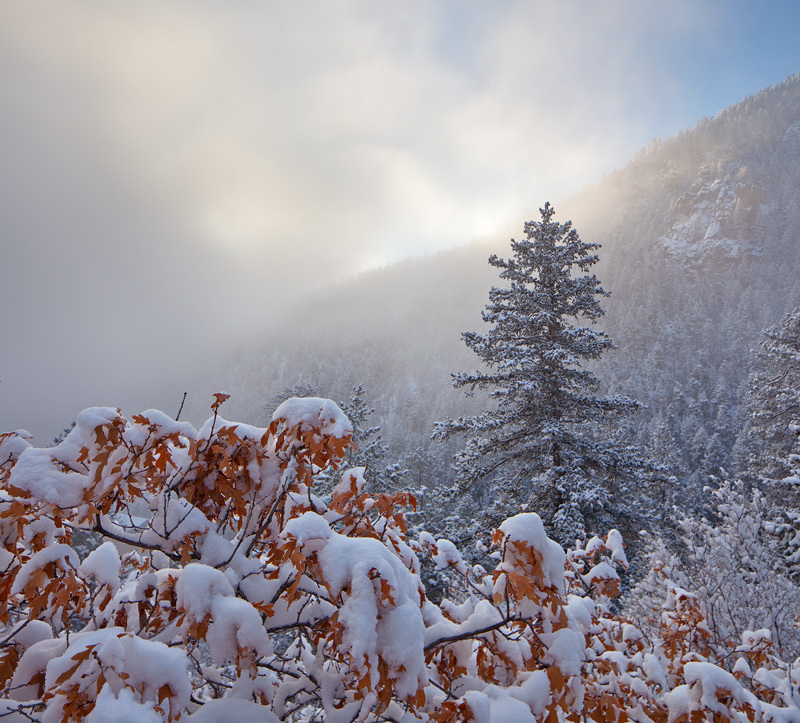 I stopped to take some time lapse of the scene–this video clip can be seen in my recent time lapse project, “Winter All Around Us”, which I wrote about in my most recent blog post. 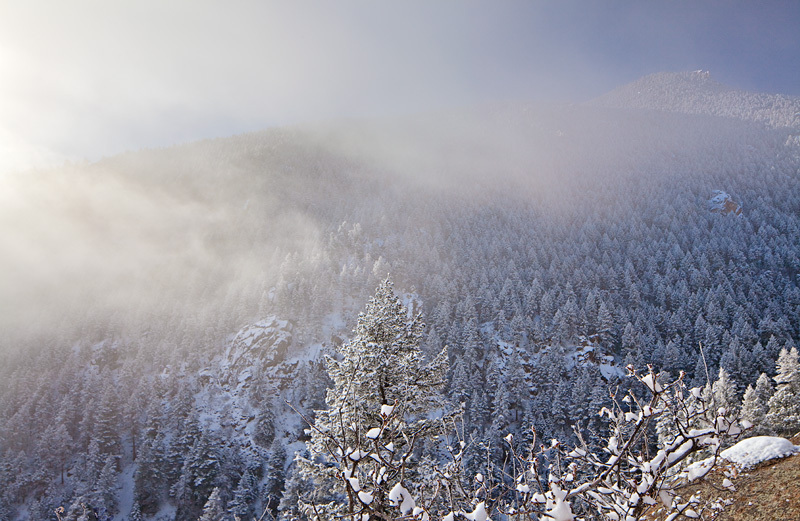 Sun trying to burn off the fog on the Barr Trail in Manitou Springs. 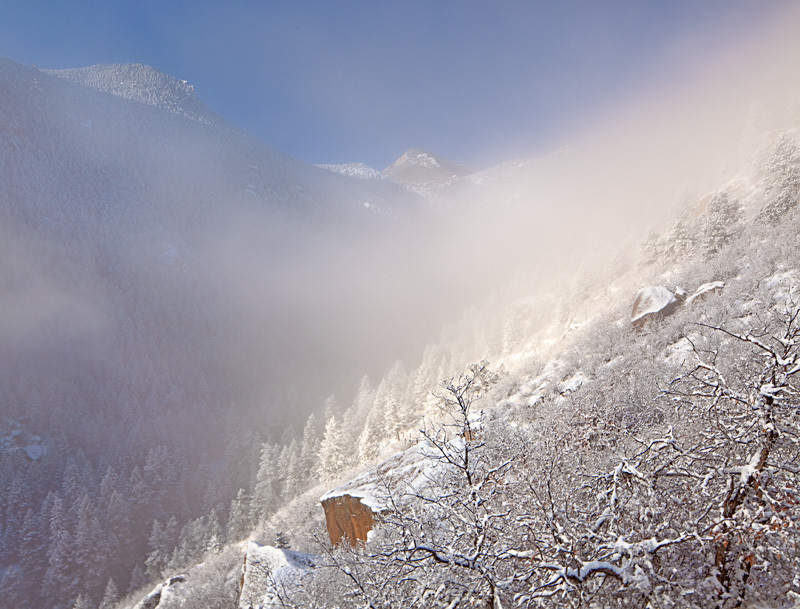 Magnificent foggy atmosphere on Pikes Peak’s Barr Trail after a light snowfall. March, 2014. As I descended, it seemed like scores of trail runners were now ascending the trail for their Sunday morning workout. On woman stopped briefly as she noticed my tripod and camera gear set up along side the trail, and remarked, “smart man!” Another remarked, “we’ll see your photos in the paper!” No, not smart–just a benefit of knowing a bit about the weather of this area. And you wont see the photos i the paper–just here in my blog 😉 I shared their enthusiasm though–it was a terrific Sunday morning to spend on Pikes Peak!